From multi-billion- dollar assets like Navy ships at sea to cars and SUVs driving on highways and roads, imagine the day when you can visit any repair or service shop and get replacement parts on-the-spot. A team of scientists at GE Global Research, the technology development arm for GE (NYSE: GE), have been awarded a four-year, $9 million program to develop a rapid process for creating exact digital models of replacement or newly designed parts to move closer to that day. Together with scientists and engineers from GE Aviation, GE Additive, Honeywell, Penn State, Lawrence Livermore National Laboratory (LLNL), Navy Nuclear Lab (NNL) and the National Center for Defense Manufacturing and Machining (NCDMM), the team is building digital twins from model-based data on parts and sensor-based data from 3D metal printers to dramatically speed up the qualification and certification process for replicating and printing replacement parts no longer manufactured for various naval marine and aviation assets and to create parts for newly designed assets. GE’s Digital Twins are living, learning digital models of physical assets, parts, processes and even systems. These models are continually updated as new sensor data or engineering knowledge from technical experts is integrated to reflect the exact state of its physical counterpart at any point in time. Having a rapid process for producing and installing replacement parts would greatly support the U.S. Navy’s efforts to manage and maintain excellence for an aging Navy fleet. The average age of active Navy ships, for example, is ~17 years, with the oldest in service deployed in 1970. In cases where ships are several decades old, replacement parts often are no longer manufactured. This is like what car enthusiasts have experienced when rebuilding or repairing classic or older cars. Just like the automotive sector, the Navy is turning to 3D printing to get the parts they need faster. LLNL is bringing to the partnership its years of research and development of intelligent “feed forward” design methods in metal additive manufacturing. The Livermore method combines multi-physics modeling and simulation with state-of-the-art experimental observations to train 3D printers to predict and produce defect-free metal parts the first time, in lieu of traditional “trial and error” approaches. The four- year program will occur in two two-year phases. Phase 1 will focus on the underlying software and hardware developments. 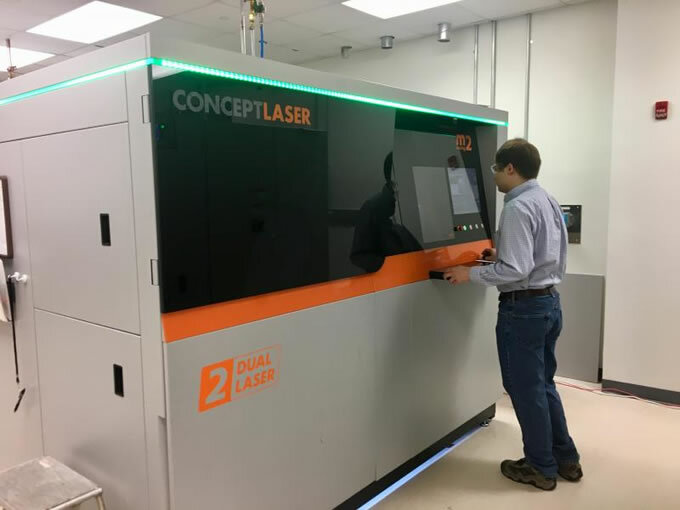 In Phase 2, we will build a complete additive system that demonstrates the rapid and robust creation of a part’s digital model or digital twin and printing of that part using a 3D Direct Metal Laser Melting (DMLM) printer. GE Global Research is the hub of technology development for all of GE's businesses. Our scientists and engineers redefine what’s possible, drive growth for our businesses, and find answers to some of the world’s toughest problems. Visit GE Global Research on the web at www.ge.com/research. Connect with us at http://twitter.com/geresearch.